Thoughts and prayers. A rather tepid response to the deaths of 5 people working in a constitutionally protected field, when you think about it. Even by the standards of a president who routinely castigates journalists — and who on Thursday devoted much of a 77-minute news conference to criticizing his press coverage — Mr. Trump’s tweet was a striking escalation in his attacks. Donald Trump ignored questions about the killing of five people at a newspaper in Maryland, walking silently past reporters at the White House as they asked him for “any words about the dead”. The president did not respond when asked for “any words of condolence” for families of the victims of the shooting at the Capital Gazette's offices in Annapolis on Thursday. Cold. Callous. Authoritarian. Donald Trump. I don't know what a post-Trump America is going to look like. I was going to ask you about about Donald Trump's flip flop on North Korean denuclearization (first he tweeted they're no longer a nuclear threat but only four days ago he still signed an executive order stating exactly the opposite) but instead I'd like to ask you about Trump's Oath of Office. 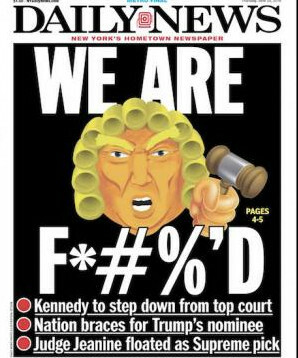 He took an oath to "preserve, protect and defend" the U.S. Constitution and part of that Constitution is the legal requirement of due process. Yet recently he tweeted that "we must immediately, with no Judges or Court Cases" deport "these people who invade our country." No due process despite the fact that the Equal Protection clause is part of the Constitution that Donald Trump swore an oath to uphold. So here's my question: Why do you, Senator Toomey, continue to support as president a man who simply fails to respect our Constitution? 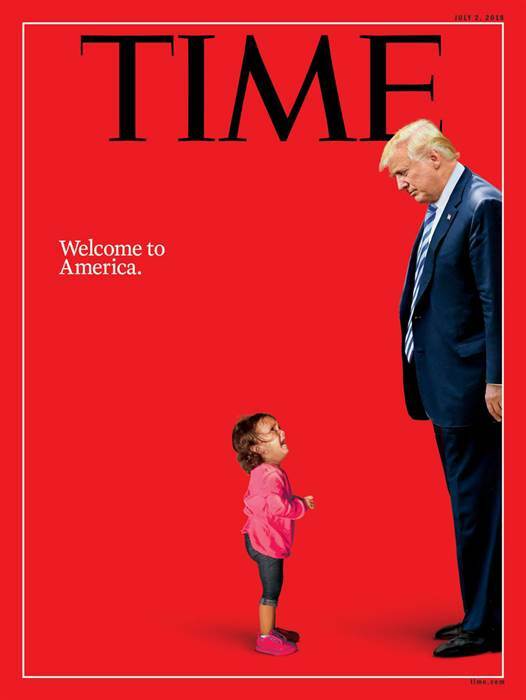 Trump: Making America Great Again. One scared, crying little girl at a time. Thought bubble for what Trump would be thinking in this photo: "Hey this is on you. If you didn't want this to happen to you, you probably shouldn't have left your shithole country." The May temperature across global land and ocean surfaces was 1.44°F above the 20th century average of 58.6°F and the fourth highest for May in the 1880-2018 record. The years 2014-2018 rank among the five warmest Mays on record, with 2016 the warmest May at 1.58°F above average. May 2018 also marks the 42nd consecutive May and the 401st consecutive month with temperatures, at least nominally, above the 20th century average. The May average Arctic sea ice extent was the second smallest in the 40-year record at 420,000 square miles (8.1 percent) below the 1981-2010 average, according to an analysis by the National Snow and Ice Data Center (link is external) using data from NOAA and NASA. Only the May Arctic sea ice extent in 2016 was smaller. The near-record low Arctic sea ice extent was mostly due to much-below-average sea ice in the Bering and Chukchi Seas. Antarctic sea ice extent during May was 330,000 square miles (8.6 percent) below the 1981-2010 average, the third smallest May extent on record. Antarctic sea ice expanded at a rate faster than average during May, with below-average ice coverage continuing for parts of the Weddell Sea. Ah, the GOP. Where scientific fact (climate science, evolution and so on) is propaganda and outright BS (Pizzagate, Obama's "fake" birth certificate - and of course Climate Science denial) is taken seriously. And they're the folks in charge. I’ve played this show 146 nights with basically the same setlist, but tonight calls for something different. 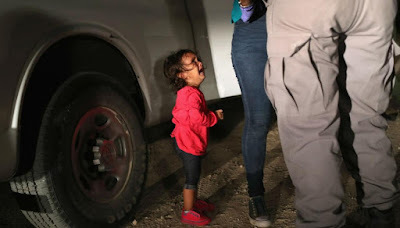 We need to talk about the crying children at the border. This Trump administration policy (and yes it is a new policy enacted by the Trump administration and not, as Trump dishonestly stated, a holdover from the previous administration that only the Democrats can fix) is so reprehensible and indefensible that you're either against it or you're complicit in its cruelty. Some recent poll data suggest that about 2/3 of American voters oppose Trump's immigration cruelty while a little over half of members of your party are OK with it. I thought your party was the "pro-family" party. Simple question this week. Where, exactly, do you stand on this, Senator Toomey? Are you OK with it, as 55% of the members of your party seem to be, or are you against it? When will you stand up to denounce Donald Trump's cruel policy separating children from their parents? 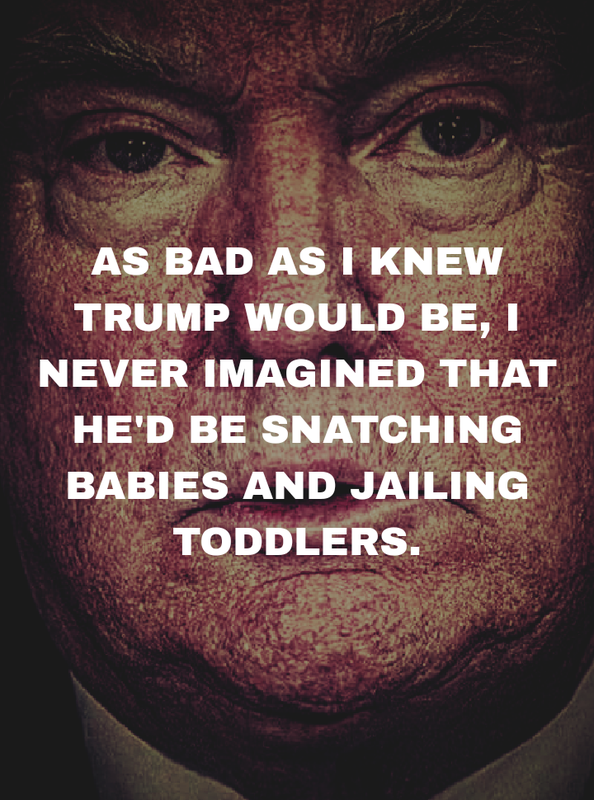 The media needs to ask every Republican who repeats the line 'when people commit crimes, they are put in jail and separated from their children,' if they walked out of the room right now and jaywalked across the street if they would be thrown into jail and their children would be taken away? 1) There is no 'law' that says we must separate children from their parents at the border. 2) Not only is it not a 'Democrat law,' it's not even a Democratic policy. 3) Nor are the Democrats 'the only ones who can fix this.' Republicans control Congress and the White House. 4) Every time Trump and Huckabee Sanders repeatedly say any of this, they are lying. 5) I have to stop literally screaming 'liar' at my TV screen when they do as I'm scaring my cat. We have to talk about this week's G7 meeting and the summit with North Korean dictator Kim Jong Un. In the space of a couple of days this week, Donald Trump, the man whose administration and policies you support (and the man, let's all remember, you voted for) picked an unnecessary fight with Canada (a country that's been among our closest allies politically as well as geographically) and yet took time out to say it was "an honor" to meet Kim Jong Un, the North Korean dictator, a man who is guilty of committing some of the most horrific crimes against humanity. Simple question for you this week: If this isn't enough for you to finally turn your back on the leader of your own party and say, "Enough!" what then, is? By remaining silent, Senator, you are complicit in all of Trump's indecencies. You do know that, don't you? You could be among those doing something to stop him from committing more damage to the country. If you choose not to, then part of the responsibility for that damage will be yours. You do know that, don't you? When can we expect to hear you speaking out?